Great for Warriors, Pirates, Rogues and Nobles alike. Roughneck Pants,Large, Stripes, discontinued priced to sell !! Roughneck Pants,Large, Black, discontinued priced to sell !! Roughneck Pants,Extra Large, Black, discontinued priced to sell !! Roughneck Pants, Extra Large, Stripes, discontinued priced to sell !! How do I become one of those guys that jousts and sword fights? Well, it's simple, you simply . Oh wait. No, that's not the most vexing question, that's just MY question. Sorry, the most vexing question is: How can I score with two serving wenches at once? Uh. no, sorry, again a particularly vexing question for me, not necessarily THE most vexing question. Actually, now that I think of it, it probably IS the most vexing question for men at renaissance festivals. But the question I'm really talking about is this one: What the hell do I wear on my legs at these things? (And if you figured out the answer to the serving wench question, then the answer is, of course, serving wenches). Look no further for an answer; Strongblade presents, the Roughneck Pants. These pants are baggy light, cool, and extremely comfortable. And, if you have the answer to the serving wench dilemma, they're also very easy to take off quickly. (Editor's note: We assure you that this will be the last crude reference to serving wenches. Isn't that correct, writer?). Uh . so anyway, these pants are made from a light-weight cotton and feature very deep pockets for storage of everything from cell phones and keys to gold dubloons and those giant turkey legs (good thing these are machine washable, eh?). 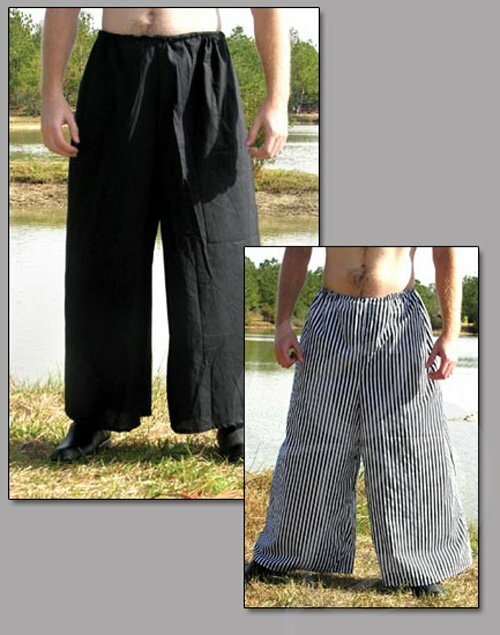 The Roughneck Pants have a drawstring waist for a perfect fit and come in black, or white with black stripes. Machine washable, tumble dry. Materials: Lightweight cotton. Features deep pockets and a drawstring waist.